Well... that certainly took a long time. Club Penguin's never late like that. Maybe it leads to the new mission like Herbert and Kluzy attack the Club Penguin computers and stop the process to making the catalog, the pin, and fireworks! 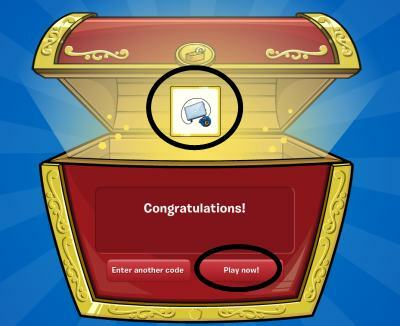 LOL I know I'm crazy sometimes, but seriously, maybe Club Penguin has worked so hard on the new mission that they had to stop the entire process, which is why the catalog was late. Anyway the catalog is here now with a cool new feature which I'll get to later. Let's get on with the cheats. You have now found the Pink Flippers! You have now found the Stocking Cap! You have now found the Long Johns! You have now found the Drumsticks! You have now found the Trumpet! You have now found the Acoustic Guitar! You have now found the Snare Drum! 18. Click on the word "WORK"
You have now found the Black Superhero Mask! You have now found the Dizzy Hairdoo! Also like I said before there is a new feature. You can literally make your own t-shirt! You choose the color and the design and then pay 250 coins... pretty cool right? hi me agin i I WONT SOME THING NEW!!!!!!!!!!!! !!!!!!!!!! hey i wont som thing new and im gona stop playing club penguin becos im getting bord realy bord!!!!!!!!! !